10% of card and calendar sales is donated to Heifer International every year! If you need a bunch of holiday cards, please email me between now and November 30, 2017, to let me know what you'd like to order. Remember that you can have twenty or more cards, featuring your choice of painting and greeting, printed up just for you for $1 per card (plus tax and shipping where applicable) via good-old, painless PayPal. I've been printing my MaryBrook holiday cards featuring my paintings for ten years now - and I still donate 10% of MaryBrook sales to my favorite charity, Heifer International. To order a print of any painting you see on my site, please use FineArtAmerica. Let me know if you need me to provide them with an image of a painting you see on my site - I've already uploaded quite a few. They have an incredible variety of styles and sizes of prints available, and they do a good job. They can make cards from my paintings too, and they are lovely (5x7" full bleed, very classy!). You can even order single cards if you like. which is what I need to do the most! 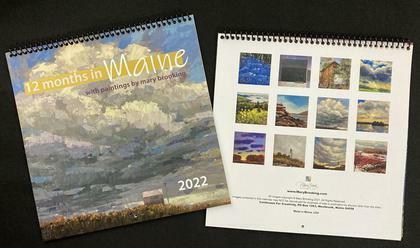 My 2019 calendars have been printed, right here in the Great State of Maine! Lots of people told me last year that my calendars were a great holiday gift. Please email me or stop in at Continuum For Creativity to purchase your calendar. Calendars are 9x9" and cost $15. Tax and shipping will be added where applicable. 2019 Calendars are ready now!